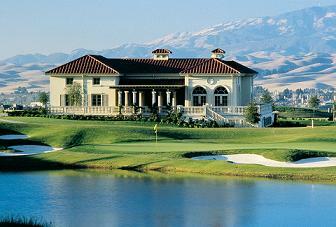 The master-planned community of Ruby Hill celebrates the scenic splendor of the Livermore Valley Wine Growing Region. Lush vineyards and oak-strewn hills provide the perfect accent to the elegant residences of this picturesque setting. Ruby Hill's gated community offers an array of recreational amenities for all residents. A set of tennis, a refreshing swim, a play date for your preschooler, a picnic in the park, or a bike ride through the vineyards . . . at Ruby Hill the possibilities are endless. For an incomparable golf club experience, the private Ruby Hill Golf Club features a Jack Nicklaus-designed championship course exquisitely crowned by the magnificent villa-style clubhouse. This prestigious address ensures a lifestyle of activity, adventure and fun. Pleasanton, the jewel of the Amador Valley, is located in the eastern portion of the San Francisco Bay Area. This 18-hole course on 225 acres plays to 7,400 yards from the Nicklaus tees. The distinctive Nicklaus layout incorporates well contoured bunkers, magnificent water features, natural arroyos, towering oaks, inspiring vistas and exciting elevation changes. The Crenshaw bent grass greens and all-weather Bermuda grass fairways are designed especially for year-round play. Ruby Hill Golf Club also provides its members with a 14 acre practice facility including driving range, putting green, practice bunkers and greens. The amenities don’t stop there. For your enjoyment we also have a Jr. Olympic swimming pool, spa, lighted tennis courts, exercise rooms and trellised covered Bocce courts. Fabulous golf combined with great dining, an active social calendar, and plenty of family fun for everyone means you are right at home at Ruby Hill Golf Club. Picture an evening of open- air dining on the travertine patio with your family, friends, and neighbors as you enjoy a game of Bocce or just watch the sunset along side Mt. Diablo. Ruby Hill Golf Clubs offers 3 types of Golf memberships, a Tennis & Swim membership as well as a Social membership. Non resident memberships are available in every category. All memberships are Non- Equity memberships.